The Love Birds Companion Wood Cremation Urn is a solid walnut urn with select hardwoods forming the inlaid doves or love birds. This beautifully crafted urn is suitable for burial, placing in a niche, or displaying in your home. Bottom opening plate attaches with screws. It is highly recommended to keep the cremains inside a sealed plastic bag inside any urn. This urn has only one compartment but will accommodate two bags of cremains or one large bag of cremains if you would like the cremains of both people combined. 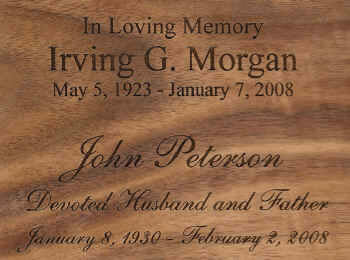 The TOP of this urn can be personalized with name, birth and passing dates, and a short sentiment. The front of the urn cannot be engraved due to the inlaid birds that take up most of the room on the front. Please limit engraving to no more than 40 spaces per line. You will not receive an engraving proof so please check the spelling, capitalization, punctuation, and dates very carefully.